What is a boiler system? How does it compare with other residential heat system types? When should you choose a boiler system for heating your home? How to Get the Best Boiler Prices? Here’s how a boiler works. The boiler’s burner consumes fuel to create heated combustion gasses. They pass through a heat exchanger that transfers heat into the water before being exhausted from the house. The hot water is circulated through a closed system of pipes to baseboard radiators or through radiant heat floor tubing. The heat from the water radiates into the living space. The water cools as it circulates, eventually reaching the boiler where it is reheated. Controls regulate when the burner fires and maintain the temperature of the system’s water. The increase in volume of heated water is accommodated by an expansion tank. Heat distribution: Most boilers circulate the water to baseboard radiators or in-floor radiant heat systems using a pump/circulator. The radiators have fins like a car radiator that maximize surface area for efficient transfer of heat. Boiler size: The heating capacity of a boiler is measured in Btu’s of heat it can produce in one hour (Btu/h). However, to simplify the numbers, the heat capacity is typically listed in MBH where M=1,000, B=Btu, and H=hour. Residential boilers are produced in capacities from about 35,000 Btu/h to 399,000Btu/h, so written as 35 MBH to 399 MBH. Each model is made in several sizes. See more information below on sizing a boiler to your home or light commercial needs. Boiler efficiency: Boiler efficiency is measured in Annualized Fuel Utilization Efficiency (AFUE) and expressed as a percentage of the heat created being transferred into the system’s water rather than lost in the combustion gases exhaust. The least efficient boilers have AFUE ratings in the low-80s. The most efficient have AFUE ratings above 95%. Whole-house heating: When your thermostat calls for heat, it triggers the boiler’s circulator to begin pumping heated water through the system. Zoned heating: One of the compelling reasons to consider a boiler system is that it allows for zoned heating. When a zone is being heated, control valves allow the right amount of hot water to enter the zone’s radiator to deliver the desired heat. If space is not being heated, the control valve remains closed, and the hot water bypasses the radiator. Fuels: Natural gas is the fuel most used, but boilers can be designed to heat with propane, heating oil, biodiesel fuel and wood. Boilers with AFUE efficiency between about 80% and 84% are termed standard efficiency. If the units have 85% to 90% efficiency, some brands call them high-efficiency boilers. Most standard boilers have cast iron heat exchangers. These are the most affordable boilers, and they meet federal minimum efficiency standards. Condensing boilers can be floor mounted (large capacity) or wall mounted (small-medium capacity) units. What sets them apart is their efficiency levels of 95% AFUE or higher. The efficiency is achieved with a complex heat exchanger, usually aluminum (90% AFUE) or stainless steel (95% AFUE), that maximizes heat transfer through condensing the moisture that is a byproduct of combustion. Water boilers create water temperatures that do not exceed 200F. Steam boilers heat the water to the boiling point and then push steam through the system to deliver heat. Steam boilers are the minority of boilers made. Both can be fired by a range of fuels. Boilers have traditionally been installed on the floor, and many still are due to size and weight. These units are also called floor mounted or free-standing boilers. There are floor standing boilers for all fuel types, and all boilers fueled by oil, biodiesel or wood are installed on the ground. Some gas-fueled floor mount boilers can be optionally mounted on the wall. Wall-mounted boilers are space-saving, gas-fueled boilers. Most boast efficiencies of 90% AFUE or higher. As such, they can be vented through the wall rather than through the roof. Brands like Rinnai that make tankless water heaters also produce wall-mount boilers because of the similarities in design and function between the two types of equipment. Most of these units deliver less than 200 MBH and have aluminum or stainless steel heat exchangers. These are usually high-efficiency or condensing boilers. They operate either in several capacities such as low, medium and high or in a modulating spectrum of capacities that rise and fall by just a few percentage points. The benefit of staged and modulating boilers is that they deliver more precise heating that enhances indoor comfort and energy efficiency. The name is short for combination boilers and means that these units heat your home and meet your hot water needs too, eliminating the need for a separate water heater. The separate functions are called “space heating” and “water heating.” The water sent to your taps is separated from the water that flows through your heat pipes. Combi boilers are attractive because they save space, and most offer excellent efficiency. There are more than 100 brands of boilers, but here is a list of the top brands. All the best boiler brands are excellent in quality. The difference in the durability and performance of any boiler system is the quality of the installation, so hiring an experienced contractor to install your boiler and set up the system is essential. Each of these brands makes condensing units that are Energy Star qualified. Other brands that make high-quality, efficient boilers are Buderus (by Bosch), Burnham (by US Boiler), Carrier/Bryant, ECR International (by Dunkirk), ECR, Energy Kinetics, IBC Technologies, Navien, NTI, Olsen, Rinna, Utica and Viessmann. Boiler cost starts below $1,000 and can exceed $3,500 for just the unit. Installation cost is discussed later. Size: Price rises with size. Residential boilers start at about 35,000 Btu/hour and range up to 399,000 Btu/hour. Boiler literature often uses the designation MBH to stand for “thousands of Btu per hour.” So, a unit with input capacity of 160,000 Btu/hour might be labeled 160 MBH. Performance: Performance features include staged and modulating heating, turn-down ratios (TDRs) that allow you to use just enough of the unit’s capacity for your needs, combi boilers that heat your water (domestic hot water/DHW) and your home and wi-fi control. Efficiency: The more efficiently the unit uses fuel, the higher the cost will be when size and performance are equal. How much does a boiler system cost? There are several ways to sort out residential boiler prices. The comparisons in the tables below will help you decide which type to buy and how much it might cost for the unit. A discussion of installation cost and factors follows. Standard Gas Boilers: These are non-condensing gas boilers with efficiencies from 80% to about 90%. Their size range is about 35 MBH to 399 MBH. Most are fed by a natural gas supply from the local utility company. Propane is delivered to the home and stored in tanks rented from the supplier. Rental is typically free if the customer uses a minimum number of gallons of propane annually. Condensing Gas Boilers: These 90%+ efficiency models range in size to 399 MBH, and their large capacity accounts for part of their much higher cost. Combi Boilers: As we noted, combination boilers heat space and water in separate pipe systems to deliver 2-for-1 performance. Combi boilers range in size to about 150 MBH. Oil Boilers: Oil boilers are only used in the Northeast US and Eastern Canada due to a lack of natural gas and propane in those regions. Most are non-condensing boilers. The table above gives you an idea of how brands compare in cost. See our reviews of individual brands for more specific pricing by brand series and size. Now, here is a look at the average cost for both the unit and installation. The number and types of equipment needed such as one or more manifolds, water-to-water or water-to-air heat exchangers and extra pipe. New ductwork, in-floor pipe for radiant heat or new baseboard radiators: $1,200-$5,000 depending on the type used and the size of your system and home. Zone controls: $1,000 to $3,500 depending on the type and number of zones. Thermostat: $30-$500. A wide range of thermostats are available from simple mechanical/digital models to smart thermostats like Nest and Ecobee to wi-fi connected touchscreen models. System upgrades: There are several add-ons designed to make a home healthier and more comfortable. We’ve addressed these extras and their costs in a series of articles. Here they are with links. It’s impossible to over-emphasize the importance of having a boiler sized correctly for the space it will serve. Most contractors will conduct a traditional Manual-J Load Calculation to determine heat loss through the various aspects of your home’s construction such as windows, doors, walls and the ceiling. 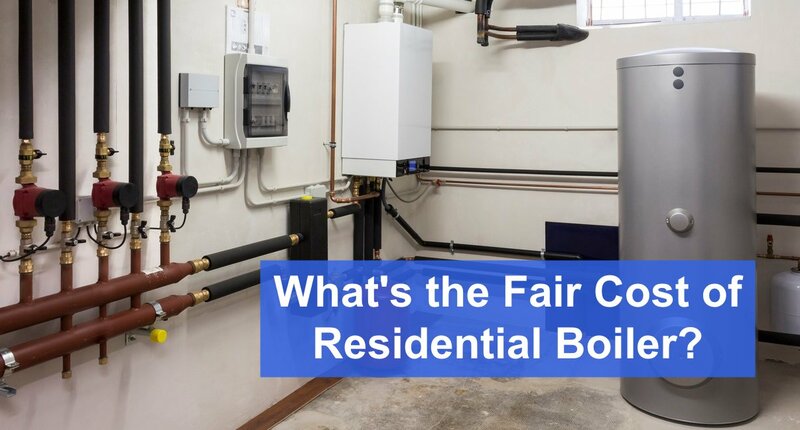 We’ve prepared an in-depth guide for sizing any HVAC equipment properly with a Manual-J load calculation, but here is a quick and easy way to have a ballpark idea of what boiler size you’ll need. It starts with finding your zone on this US Climate Zone Map below. 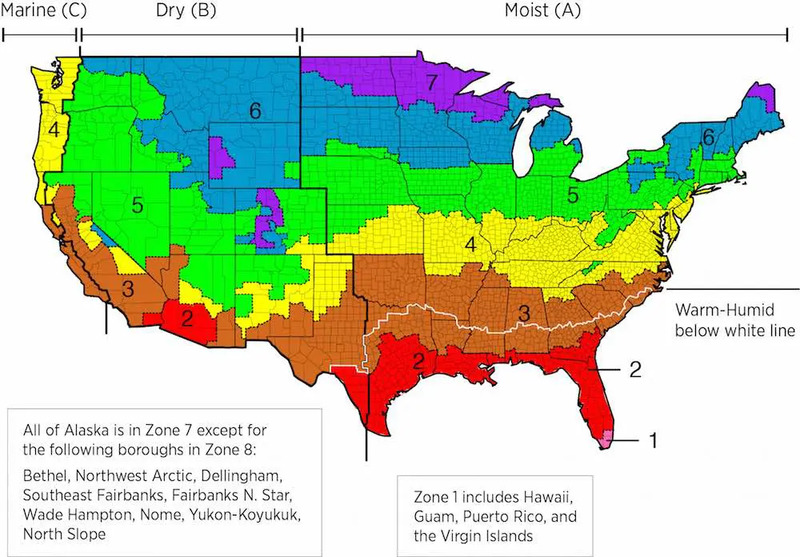 Now, use this chart based on climate zone and the size of your home to estimate the size of the boiler you’ll need. The ranges are based on variables such as how much insulation your home has, its number of and the energy efficiency of doors and windows, roofing material, the foundation type and whether your home or building is a single-story or multi-story structure. Zones 1 & 2 (hot): 18-30 Btu/sq. ft. Zone 3 (warm): 25-35 Btu/sq. ft. Zone 4 (moderate): 28-40 Btu/sq. ft. Zone 5 (cool): 40-50 Btu/sq. ft. Zone 6 (cold): 50-60 Btu/sq. ft. Zone 7 (very cold): 50-60 Btu/sq. ft. The colder your region is, the larger the boiler capacity will need to be to meet your home’s heating requirements. For example, a 2,000 square foot home in Zone 7 would require a boiler capacity of 100,000 to 120,000 Btu or 100-120 MBH. The same home in Zone 4 would need a boiler with 56-80 MBH capacity and in Zone 1 would need a boiler capacity of 36-60 MBH. If you’re replacing a boiler, it will need to be smaller than the old one if the home has newer windows or more insulation than when the previous boiler was installed. A replacement boiler will need to be larger if it will be required to heat additional space such as a finished basement or converted garage. Large additions require a separate boiler or other sources of heat. If eco-friendly heating is a high priority for you or if you plan to live in your current home for at least seven years, then a high-efficiency standard model or a condensing boiler makes sense. I purchased my current boiler and had it installed a couple of months ago. It is an amazing American Standard Boiler and has not had any issues since installation. I do not have to keep on cleaning it and maintain it. After a few weeks, I realized it makes a buzzing noise but it is not that loud. It did not cost me much to repair this considering it is the only repair I have had to make. Honestly, I would not opt for any other boiler brand as this one has been strongly approved in the industry and according to me, it is the absolute best. I really love the efficiency of the boiler and it helps me save on my electricity bills. I would strongly recommend it to anyone who wants a high-quality boiler. My wife and I bought the Central Boiler unit two years ago and we are so happy we did not waste our money. It was a difficult time for us as we had just spent a lot on our wedding so we were not that sure about having the boiler installed. We, however, noticed that the boiler is really easy to maintain and surprisingly, have not repaired it since the purchase. It has been resistant to damage caused by climate change. We are also glad that we bought the biggest model. We were hesitant at first but the product was recommended to us by a friend. After installation, we are glad to say that our doubts and fears were cleared out. We’ll always opt for the Central Boiler anytime and recommend it to family and friends. I have owned the Clark Reliance boiler for a few months now and I’m already thinking of selling it. During the first weeks after purchasing it, I really loved as it took a little time to heat and suited me. After a while, I noticed a decrease in its efficiency and I have tried to repair it but in vain. It is disappointing because the boiler does not keep the water hot for a long period of time as it did and I am quite sure this will get even worse. I believe the problem cannot be repaired easily as I have gotten experts to try and fix it over and over again. I cannot precisely recommend this brand. I am looking forward to trying a different brand and hope the boiler will suit me this time round. I would not recommend it to people but if you want to give it a try, go ahead. There can be no better way to explain how I have benefited from my General Electric Hotpoint boiler other than I am extremely satisfied. The fact that it operates on natural gas really worked as it’ factor for me. It costs me not more than a hundred and fifty bucks annually. This includes the bills and general maintenance as well. As if this is not enough, the boiler is really quiet, unlike other brands I have previously owned. It quietly operates in my SQ and it does not take a lot of space and leaves room for storage of other equipment. I have a lot of experience on boilers and water heaters and I can confidently urge people to purchase this boiler. My fiancé and I have been debating on what boiler to purchase but we finally decided on the Williamson-Thermoflo boiler. We had stayed without a boiler for almost a month so the decision must have been a bit rushed. It only operated for a couple of weeks before we called an installer. The problem was not a major one and it did not cost that much. However, it keeps water hot for quite a long time, usually, over forty minutes and this time has not reduced over the months. We cannot be fully confident that the boiler won’t have another breakdown as time goes on, and neither are we ready to replace it or sell it as well. We’ll have to give it some more time before coming to a final conclusion. Great boiler system and more comfortable than the gas furnace system. Replaced my old Lennox boiler system for my parents. A little expensive and works fine so far. Firstly, When you looking for the best deals for Boiler, keep in mind that installation quality is always the most important thing for residential HVAC project. Thank you for using our guide for researching your boiler options. If you have comments, questions or are willing to share how much you paid for your boiler system, please join the conversation. And if this has been helpful, please share it with friends and followers to assist them in researching a boiler and comparing boilers with furnaces, heat pumps and other most efficient heating systems.